So, what are the interior design trends for 2019? Well, at Jacobs we save you the trouble of having to find out for yourself, because we’ve done it for you. And, because we create bespoke pieces to your specifications, we can accommodate almost any trend there is. Here are Jacobs top five picks of the best trends for 2019. This trend could not be more up our street if it tried. As we’ve already mentioned, handmade, bespoke pieces are what we’re all about. So, you’ll automatically be keeping on trend if you ask Jacobs to make anything for you in 2019. We will work with you to create a unique piece, like this Contemporary console table with matching mirror, or chairs and sofas, with your choice of fabric, finish and dimensions to suit your colour scheme and space. All you need to do is show us what it is you want. Antique style furniture is something we are very experienced with at Jacobs, and several, made to order, pieces we already have available are based on beautiful antique designs. Take this solid oak Jacobean style circular dining table, for example. Choose a finish to suit your colour scheme and this will fit right into any period room. And if you’re after something upholstered, Moon fabrics, are just one of our many fabric producers and have the most wonderful, traditionally made wool fabrics, with classic designs and superior quality – add some true British heritage to your rooms. We’re also especially proud of this Victorian style bespoke bathroom which really highlights the beautiful results that can be achieved by working together with Jacobs. The devil is in the detail, or so they say and detail can elevate an average piece to something quite spectacular. Here at Jacobs we excel in detail, take our Parker headboard, for example. This fabulous contemporary headboard has an oak show wood frame, (but can be produced in any wood or colour) and can be upholstered in a fabric of your choice. But, what really makes this piece stand out is the chrome stud detailing, which brings it together beautifully. And, if you have a commercial project in mind, detail like the hand quilted backs on this bar seating, fit this trend perfectly. 2019 is going to be the year of curves, and we have lots of lovely pieces that fit this brief perfectly. Our Domeba Cow hide chair is the ultimate in sensuous curves. The beautiful teardrop shaped arms are as beautiful to look at as they are comfy to rest your arms on. Our hug chairs, available in double or singles, are truly curvaceous, hugging the back of the sitter, providing comfort and support and the deep buttoned detailing is always in trend. And, if you do choose the cowhide finish for the Domeba chair, you’ll be hitting another 2019 trend – natural materials. In fact, many of the materials we use are completely natural, often combined with more modern products in order to provide structurally sound results. A project we recently completed which follows this structure is a large table for a client in Hale. 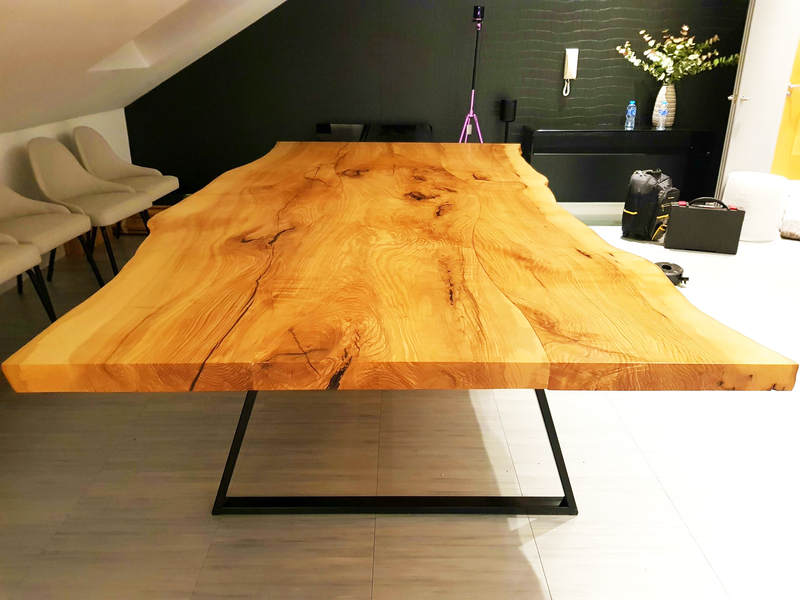 The table is 1500mm wide 3000 mm long and made from two huge slabs of timber called Olive-ash. We combined this timber with a sleek modern base for a more secure design and created matching contemporary chairs. Finally, nothing could be more natural than this Waney Edge Shelving, left in a completely natural shape, using raw sawn shelves, this is as unique as it is functional. As this piece is truly a one off, you’ll be hitting three trends – curvy, handmade and natural. After the 2018 woodworking machinery show at the NEC, we have also invested in two new pieces of machinery to create unique curves in bespoke furniture pieces. The first will bend and laminate structural veneers into spectacular curved shapes, perfect for seating and cabinets. The second machine will wrap wood veneers around shapes which is ideal for adding unique details to custom furniture pieces. Look out for future blogs and bespoke furniture creations made with these state of the art machines.